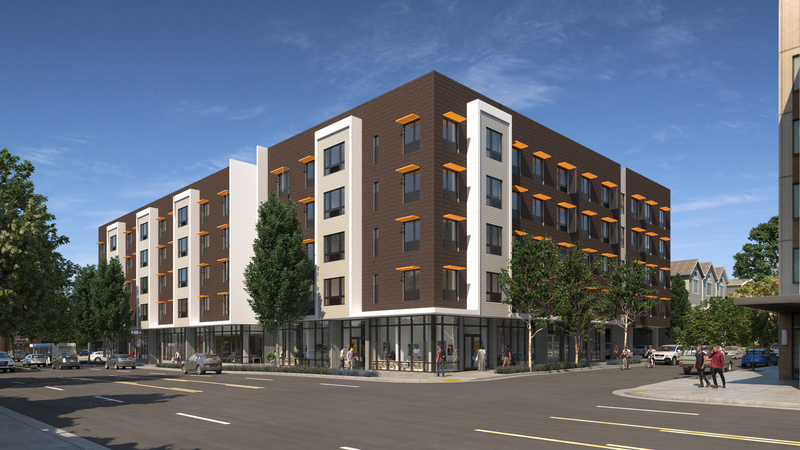 The Beatrice Morrow - Portland Community Reinvestment Initiatives Inc.
PCRI is proud to develop The Beatrice Morrow: affordable rental housing and community-serving commercial retail space at the site of the former Grant Warehouse on NE Martin Luther King Jr. Blvd. between Cook and Ivy Streets. The development is currently under construction. The Beatrice Morrow is targeting LEED Gold certification for its healthy, energy-efficient design. 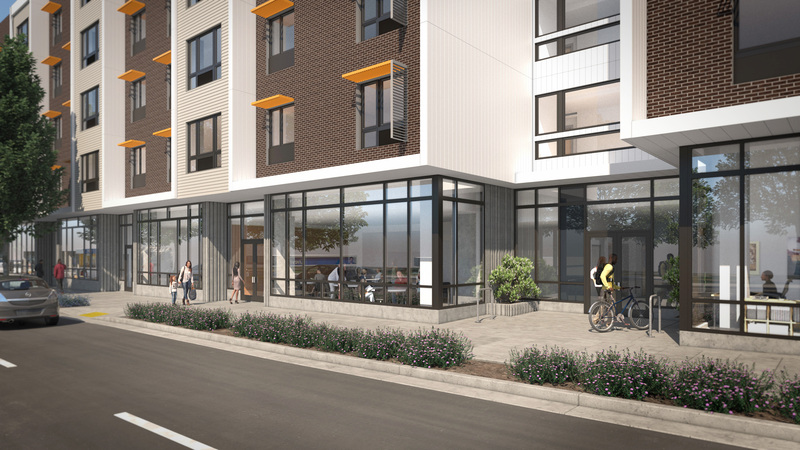 It will encompass 80 affordable apartments prioritized for historic residents of North and Northeast Portland, including studio, 1-, 2- and 3-bedroom apartments (proposed floorplans can be viewed HERE). Each apartment will have air conditioning, full kitchens including dishwasher and microwave, secure elevator access, laundry facilities on each floor, and a generous ground floor community room with an on-site resident services coordinator and a computer lab. A secured bike room is available. Parking will be on a first-come, first-served basis in the building’s lot. The Beatrice Morrow will be a non-smoking building. Construction began in May 2017 and completion is anticipated in summer 2018. 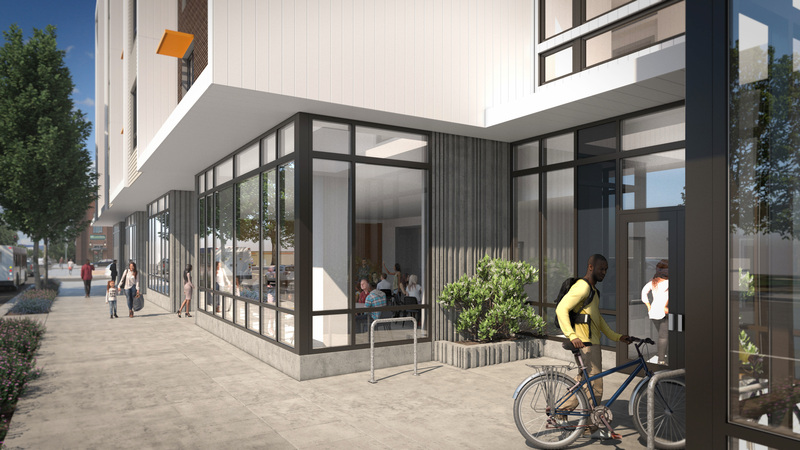 The design and amenities for the building were developed following multiple community forums and meetings with prospective tenants for both residential and commercial spaces, as well as community members. Information from these community meetings is included on our Frequently Asked Questions page. Answers to commonly-asked questions are listed HERE and will be updated throughout the project. Sign up for our mailing list (and check back often) for more information. To learn more about Beatrice Morrow Cannady, and her contributions to the city of Portland, please check out OPB’s documentary of her legacy here.